Born in 1950 in Yorkshire. Richard McGowan attended Sheffield College of Art & Design 1969-1970; Regional College of Art, Hull 1970-73. Dip.A.D. (Fine Art) and Birmingham Polytechnic Post-Grad Painting Dept. 1974-75. M.A. (Painting). He is a Visiting Lecturer to Fine Art Depts. In Sheffield, Birmingham and Coventry. He has exhibited widely in the UK and abroad since the 1970’s, with many one-man shows. Richard McGowan works are held in public and private collections in Britain and the USA, including Birmingham Museum and Art Gallery and the private estate of Royal Academician, William Gear. 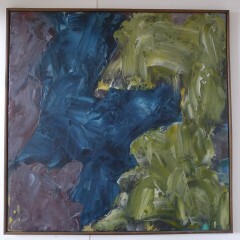 All of Richard McGowan’s paintings are acrylic on canvas or paper and range from 12 inches square to over 8 feet tall. 1978 – Four One-Man Shows, Ferens Art Gallery, Hull. 1983 – Westhill College, Birmingham. – Birmingham Polytechnic Fine Art Dept. 1984 – Hull College of H.E. School of Fine Art. 1986 – `New British Art at the Lanchester`, Coventry Polytechnic. 1988 – South Hill Park Arts Centre, Bracknell. 1990 – Crescent Arts Workshop Gallery, Scarborough. 1991 – Sheffield Polytechnic Gallery. 1994 – Bond Gallery, Birmingham. – Maclaurin Art Gallery, Ayr. 1998 – Cotton Gallery, MAC, Birmingham. 2000 – Department of Art, University of Central England, Birmingham. 2001 – City Gallery, Leicester. 2005 – Dudley Museum & Art Gallery. • South Hill Park Trust. • Estate of William Gear RA. 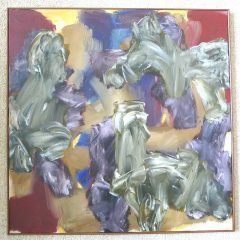 Richard McGowan painting titled ‘Interior’ 1992.